Sandwiches are incredibly versatile. People eat sandwiches at breakfast, lunch, snacks and dinner. 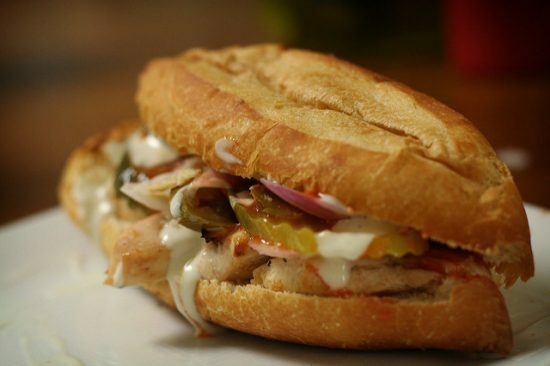 Most people have at least one favorite sandwich and the day to celebrate that favorite sandwich is here! National Sandwich Day is celebrated annually on November 3 (tomorrow). Like other nationally-recognized food holidays, National Sandwich Day will be a great day to score some deals and freebies. Where are the best National Sandwich Day deals? Arby’s: Sign up for Arby’s email deals and receive a coupon for a free roast beef sandwich. You must purchase a drink to receive this National Sandwich Day deal. Burger King: Burger King is offering a deal on its breakfast sandwiches. You can get any two breakfast sandwiches for $4 for a limited time. Domino’s: For a limited time you can get any two oven-baked sandwiches from Domino’s for $5.99 each. Use the promo code 9193. Panera Bread: Use code RPUBC2 at checkout online and save $3 on your Panera Bread order. This offer is valid through November 6. Smiling Moose Rocky Mountain Deli: On National Sandwich Day Smiling Moose Rocky Mountain Deli will give customers a free drink and chips with a purchase of a sandwich. Quiznos: Register for the Q Club and receive email deals. You can receive a coupon for $1 off your next sandwich order. Schlotzsky’s Deli: Download the Lotz4Me app and get a free small “The Original” sandwich. The deli is also doing a “buy one, get one free” promotion for National Sandwich Day. You can get any medium sub free with the purchase of a sub of equal or greater value. Steak ‘n Shake: Save $1 on a Turkey Club ‘n Fries until November 20. Subway: On National Sandwich Day you can buy any sandwich and drink and get another sandwich of equal or lesser value for free. Subway will also donate a meal to Feeding America for each sandwich they sell on National Sandwich Day. Not all locations will be offering this freebie. Be sure to call ahead and inquire about the location’s deals for National Sandwich Day. Tubby’s Grilled Submarines: Until December 31 you can take $1 off any regular or large sub. Lance Crackers: This deal may seem odd. However, crackers are often referred to as “cracker sandwiches.” To honor National Sandwich Day, Lance is offering “Buy one, get one free” boxes of crackers. You can get this deal at Lance.com. Now that you know where to get the best deals and freebies on National Sandwich Day there is only one thing left to do. Go out and enjoy your discounted (or free) sandwiches! Will you take advantage of any of these National Sandwich Day deals and freebies?